We know there are a couple of Terrible's but had never been in one until recently. The inside is decorated western style and really interesting. The bar seats were of cow hide and even saddles are available if you care to sit in one. Our main purpose was to eat. First of all we signed up for Player's Cards. For new members you have a choice of a t-shirt or a hat. Then, the casino puts $5.00 on your card to start you off. You can earn points in the restaurant or even in the gas station or country store. They have a couple on-going $9.99 specials or you can eat at the buffet. The specials include T-bone steak, ribs, pork chops or a New York steak. When we arrived they had a seafood buffet going on for $11.99. They also offer a champagne breakfast buffet for $8.99. 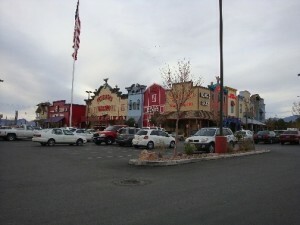 The RV area was in the parking lot behind the casino. Several RVs were parked there for dry camping. We didn't check the details but there are plenty of casinos and RV parks in the area.